Hi guys! 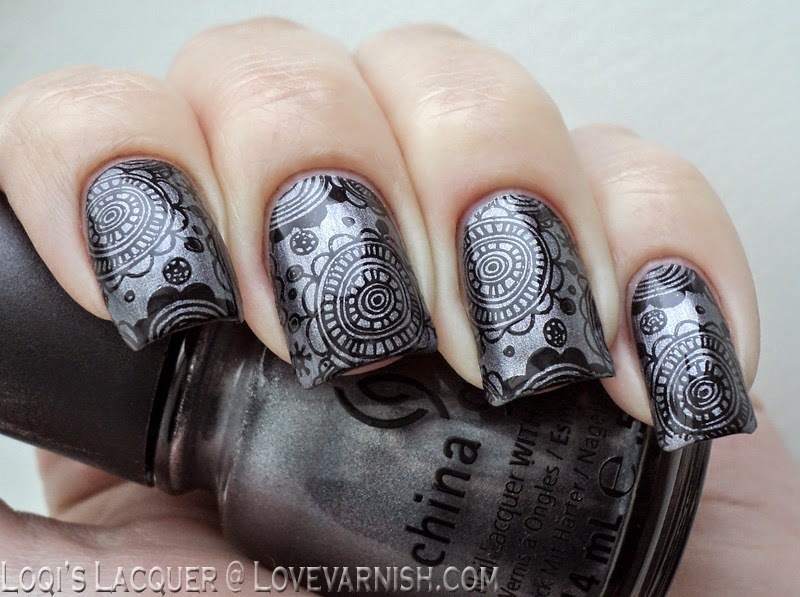 I've got another stamping manicure for you this week! Stamping still is my favourite form of nailart and I've been really into it again lately :) especially with my new bundle monster plates. Today's manicure is not done with those though, because this week I'm using an image that I've wanted to use for a long time, but just never got around to. I am of course talking about the little doodle image from MoYou plate Pro XL 14. It's just such a cute little image. For this manicure I stamped it with Konad black onto a base of China Glaze Awaken. Normally I used the polishes from this collection for stamping and I forget how awesome they are as base polishes as well, so shiny! Other than that there is not really that much more to say about this manicure really, very simple! I hope you guys like it and see you next week! I love the colors you've used for this manicure - it's visually striking! Stunning! Your stamping manis ate always so beautiful! Beautiful! I can see why that image called to you to use it. Ahhh, awaken is gorgeous!!! Love it!! And your stamping is flawless, girl! Awesomeness right there! This is one of my absolute favorite stamping images!! What a beautiful manicure! Stamping is my favorite too! These are gorgeous and really make me want to step up my stamping game. You always have flawless stamping. Beautiful! 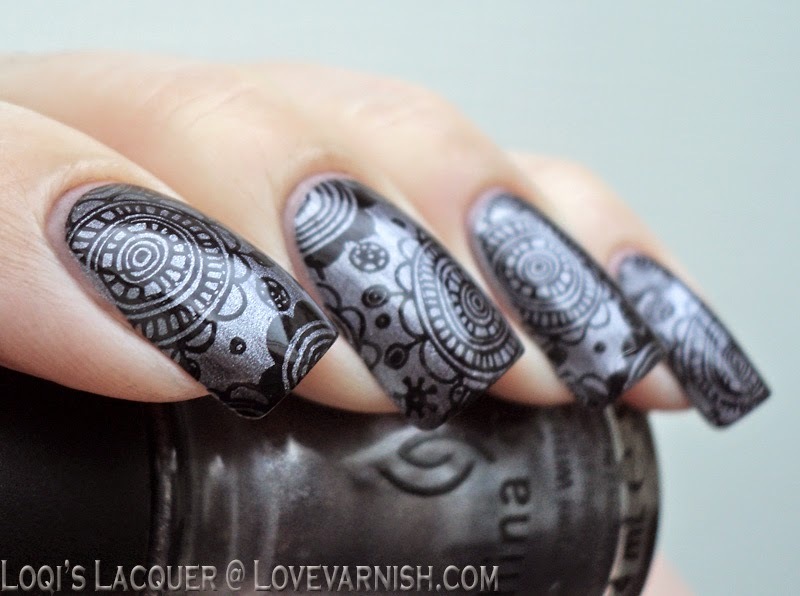 I love how graphic these are, completely awesome stamping! Oh I love the combination of the black with the grey charcoal. Your stamping manis are always so gorgeous Manon! This black stamping looks perfect over Awaken ! Love it !! Look how crisp that stamping is! I love this mani! And that China Glaze is a perfect base, too, I agree! 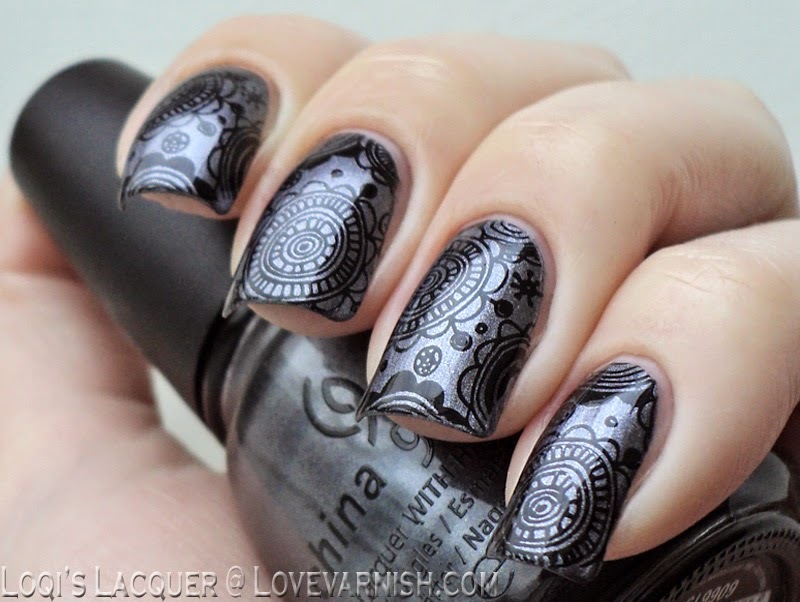 Stunning mani, you're so great at stamping! The black on grey is so crisp that it almost looks like decals instead of stamping. It's so cute, I could not not use it! It's one of mine now too! I've found that black stamping often works the best with these kind of images, it always makes them pop. Loooooove this. 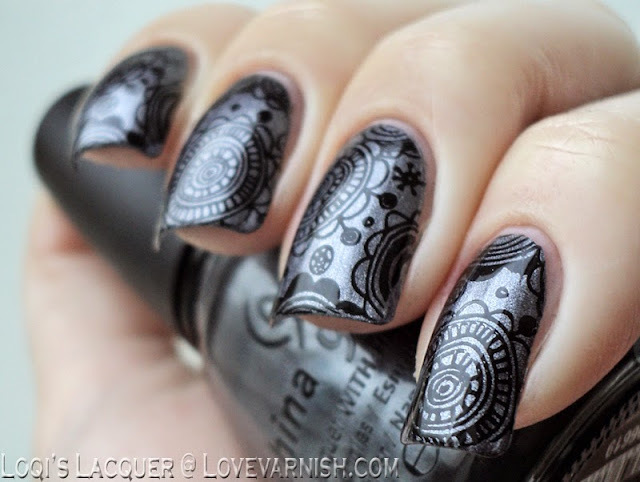 That base colour goes so well with the black stamping! I have to remember this, maybe I can recreate it, because I want this on my nails! This is so lovely, I love that stamp! I agree with you, stamping is my favorite nail art too. Once you "get it" it's so easy to do! So pretty! Your stamping is amazingly crisp, I love how this turned out! I love everything about this combo and your stamping turned out so crisp! Oh wow! I love this image! Very pretty. Love that China Glaze base color too, I have not seen it before.